Louisville Basketball Has A Rare Chance At A Double : The Two-Way The school could bring home trophies in both the men's and women's basketball championships. The first step comes Monday night when the Louisville men play Michigan. On Tuesday, the Louisville women play Connecticut. In New Orleans on Sunday, the women from Louisville (in red) defeated California to reach the championship game against Connecticut on Tuesday. Around midnight ET Monday, we should know whether something that's only happened once might happen again. If the University of Louisville's men win the Division I basketball championship — they play Michigan in a game set to start at 9:23 p.m. ET on CBS TV — then there's a chance that this year both the men's and women's trophies will go to the same school. 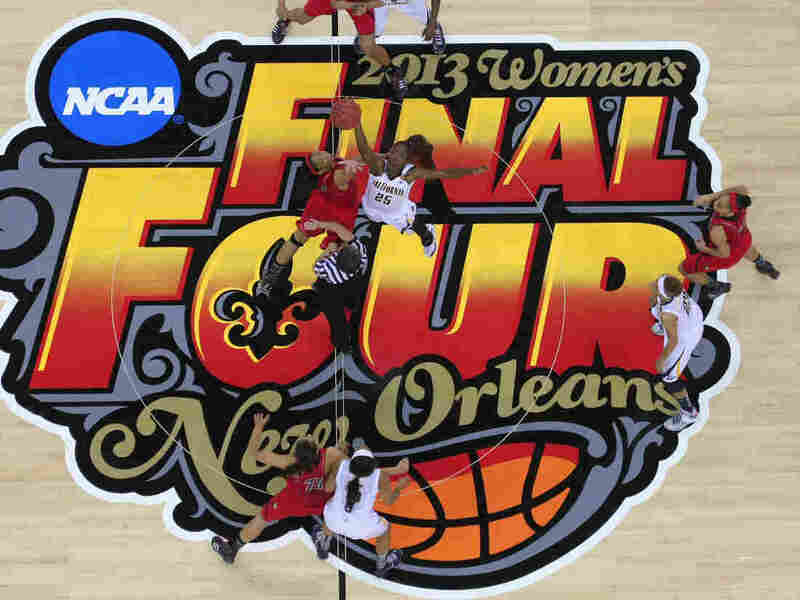 The Louisville women are set to play Connecticut Tuesday night for the women's championship. That game airs at 8:30 p.m. ET on ESPN. The only time the men's and women's titles were won by teams from the same university in the same year was in 2004. The school: Connecticut. What are the chances this year? Well, the Louisville men are favored against Michigan. But UConn is expected to defeat Louisville in the women's championship. Consider this, though: The Louisville women have already pulled off what NPR's Mike Pesca called the "biggest upset in women's college basketball history." They beat Baylor earlier in the tournament, 82-81. So, could this be the year?